With productboard's Jira integration, you can use productboard for feedback consolidation, prioritization, and roadmapping while developers use Jira for day-to-day development planning. 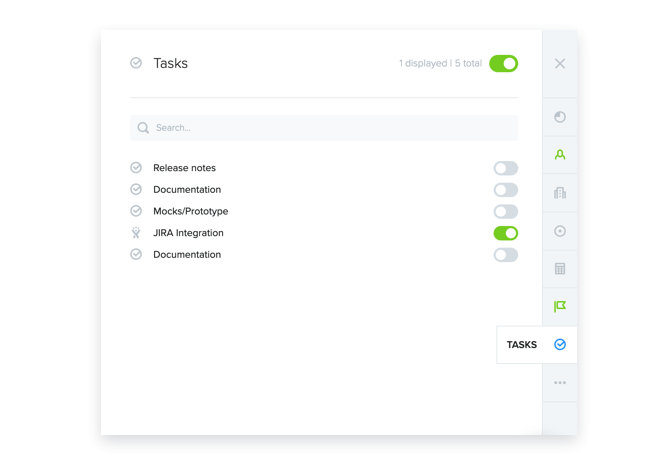 Push prioritized features and subfeatures into Jira for development and track their Jira status right from within productboard! Push productboard features as Jira epics (or stories, bugs, tasks, custom issue types). Push productboard subfeatures as Jira stories (or bugs, tasks, sub-tasks, custom issue types). Easily navigate back to features in productboard with an auto-generated productboard URL link added to Jira issues. Keep fields synced between both systems inlcuding name, description, release/fix version, and owner/reporter, as well as custom fields (like effort/story points). Import Jira issues into productboard on a one-time or automated (ongoing) basis. Push entire releases and all underlying features/subfeatures into Jira. Support for multiple Jira projects: Opt to select a Jira destination project each time you push a feature, or select a default Jira project to which all newly pushed features will be sent. Once the Jira integration is enabled, you can push a feature into Jira in its details side pane. The Jira task column allows you to easily push many features into Jira. At the moment you push a feature into Jira, you can decide its issue type. This can always be updated later in Jira. Features in productboard are typically pushed to Jira as epics. In some cases you may have small, yet important, ideas represented as features in productboard. These can be pushed to Jira as stories, bugs, tasks, or other custom issue types. Even after pushing a feature to Jira, you can always update its issue type in Jira. Subfeatures can be pushed to Jira in the same way as features. Subfeatures are typically pushed to Jira as stories. Subfeatures can also be pushed as bugs, tasks, subtasks, or other custom issue types. If a subfeature's parent feature has been pushed as an epic, it will be added to it by default. Even after pushing a subfeature to Jira, you can update it to a feature later. You can also always update its issue type in Jira. You can push a release and all its underlying features and subfeatures into Jira. You'll find this option in the side pane after selecting the release to access its details. Releases are mapped to Jira fix versions. If you have multiple release groups in productboard, you can decide which one to map to Jira fix version in productboard's Jira integration settings. You can perform one-time imports of Jira issues into productboad from productboard's Jira integration settings. 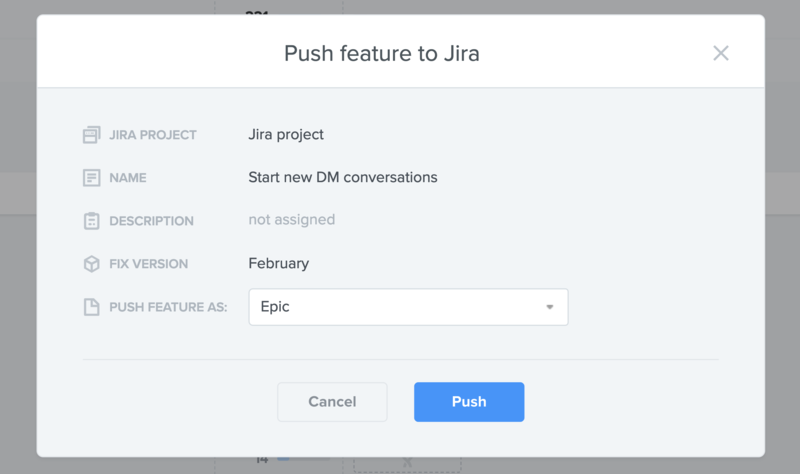 This is especially helpful if you previously used Jira to organize your feature backlog and are adopting a product management system for the first time. If you would like to import many issues, it's recommended that you do so in batches that will all be added to the same area of your product hierarchy. You can also use JQL to auto-import certain types of new issues into productboard on an ongoing basis. For example, if your team logs certain types of unexpected behavior directly in Jira, you may decide to add these to productboard as well so they can be prioritized against other feature ideas. These features are automatically tagged Jira-auto-import so you can easily find them in productboard. Now that you've seen what the integration can help you do, let's get you all set up. In productboard, use the bottom left menu to select Integrations. Beside Jira, select [+] to add a new integration. Follow the directions provided to complete authorization. The following two configurations are important to do before you begin importing/pushing features and issues. Learn more below. As soon as you set up the integration, map any custom fields in Jira that you'd like to remain synced with custom fields in productboard. Set up custom field mapping before importing issues from Jira. Otherwise custom field values won't sync until fields are manually updated. Custom field mapping does not apply to standard fields like name, description, status, fix version, reporter, etc. These are automatically synced with standard fields in productboard (see section below). You can also map a Jira story points field with the standard productboard effort field. Note that only custom fields of the same type can be mapped. For example, a checkbox field in Jira cannot be mapped to a dropdown field in productboard. 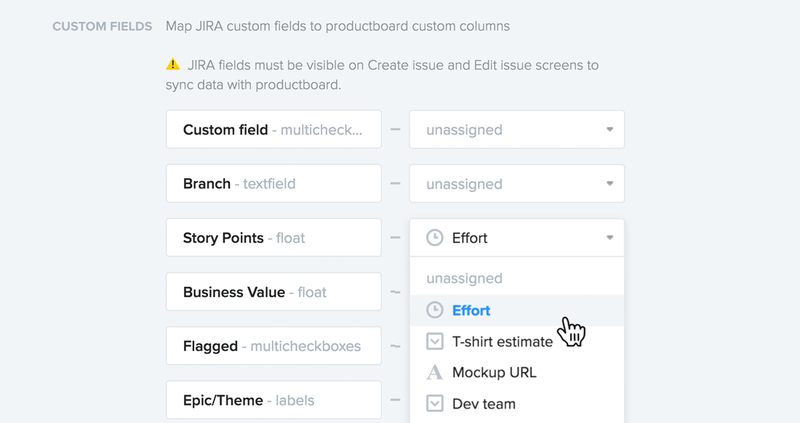 As soon as you set up your integration, you'll also want to ensure the productboard URL field is displayed on issue screens in Jira. This will help developers easily navigate from issues back to their associated features/subfeatures in productboard for user insights and business context. This field won't be updated for any issues already associated with a productboard feature, so configure this setting before you begin pushing/importing features and issues. When you authorize the Jira integration, a new productboard URL field is automatically created for you in Jira. In Jira, log in as an admin. Go to Settings (gear icon) > Issues. Under Fields, select Custom fields. Locate the productboard URL field and use the menu beside its name to select Screens. You'll now see a productboard URL field displayed on issue screens. In a new browser tab, select the Jira settings menu (gear icon) > Projects and search for your project. From the menu beside your project's name, select Project settings. In Project settings, select Screens. Uncollapse the screen schemes and see which screens are associated with the Edit Issue and Create Issue operations. Ensure the productboard URL field is associated with these screens. Reporter is only mapped if a user with a matching email address exists in Jira. Assignee is left blank so it can be filled out in Jira. It's not currently possible to associate existing Jira issues with existing productboard features and subfeatures. This can only be done by pushing features/subfeatures from productboard to Jira or importing issues from Jira into productboard. Jira's latest project type (next-gen) is not yet fully supported. See below. You can deactivate the Jira integration at any time by selecting Remove on the Integrations page. Note: Should the owner of your Integrations change, contact us to reset your integration permissions. We don't yet support Jira's newest "Next Gen" project type, but we'll be looking to change that soon. What's the difference between Jira on-demand and Jira on-premise? Learn more about productboard plans and Atlassian's cloud and self-hosted offerings.